A Confident Heart moved me from believing what God says about me, to receiving it and living in it. Renee taught me is how to “fail forward” by learning from my mistakes and leaving them behind for good - along with my guilt, shame and worry! 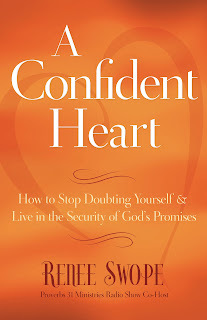 - Lisa S.
Through A Confident Heart Renee helped me see that “salvation is a one-time decision, but finding satisfaction in Christ and living in the security of His promises is a daily process.” I will read A Confident Heart over and over to keep it fresh in my heart and mind. - Margaret S.
Exhausted by the weight of perfectionism, and discouraged by the fact that I was a Christian and still struggled with insecurity, I cried out to God for help. A Confident Heart was part of His answer! It’s given me an arsenal to fight the lies I’ve believed far too long. 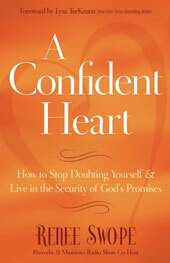 - Kimberly H.
A Confident Heart is the most vulnerable work God has called me to. I'm comfortable being transparent in my speaking but something about sharing my most personal stories, tender insecurities and paralyzing self-doubts on paper and knowing they would be printed in permanent ink was unlike anything I've done before. I felt so unguarded. And did I mention, vulnerable? Being real about how empty we sometimes feel is especially risky when it comes to our insecurities, isn't it? I think it's because we're afraid if we let people know why we doubt ourselves, they’ll start doubting us, too. Yet, I needed to take that risk with my book. I didn't write it because I'm an expert. And I don't want anyone thinking I'm a woman who has it all together, because I don't. But I do want each woman who reads my book to know she is not alone in her struggles and something isn't wrong with her because she battles insecurities. But she also doesn't have to stay stuck in that hard place as long as I did. The truth is, our insecurities are part of our spiritual formation and completion in Christ. Think about Moses, Jonah, Peter, Gideon, Martha, the Samaritan woman. All of them had self-doubts, but those doubts that led them to depend more on God. And that is a good thing. God wants US to use our self-doubts to work for us, instead of against us, too. We just need to recognize insecurity and self-condemnation as an indicator of emptiness that can lead us to His fullness. But I don't want to just tell you how to do that, I want to show you. And that is why I wrote A Confident Heart. Through real-life stories from a woman who wrestled with self-doubt for 40 years (that would be me), I want to show you how the transforming truth of Gods' Word has the power to change the way we think, feel and live. And I want to invite you to step into the pages of scripture with me so you can see and experience GOD's demonstration of His Love in YOUR everyday life. Love that is patient. Love that keeps no record of wrongs, love never fails (even when we do) and Love that is perfect so that we don't have be. I could go on and on but today we need to know this one thing: It is our emptiness (inadequacy, weakness, insecurity and doubt) that leads us to His fullness (sufficiency, strength, security and confidence)! I want to unpack that this week with you, but this time I want to talk face-to-face. Now I wish we could gather in my living room and have some girl talk. Or plan a weekend away. But that isn't possible right now, so I thought I'd talk with you via video this week. Video Details: Going against all online expert advice, I've decided to load a full message on video below. Statistics tell me you won't watch it because it's longer than 3 minutes. But will you consider it? You see, I'm convinced Jesus led me to load it here because He has something to share with you through it sweet friend. Pre-order BONUS: I have something special just for you! If you pre-order your copy of A Confident Heart through Proverbs 31 Ministries this week (before Easter Sunday) you will receive a signed copy of my book in August, and a free copy of my message "Letting God Fill the Empty Places in My Heart" on CD next week (it's similar to this video message). To start the message, click on the arrow and give it a few seconds to load. If there is a delay, just press the arrow again a few times. Renee Swope - Part 1 from SMCC on Vimeo. In my message video, I talked about the word "worship" and how it was originally derived from a blend of two words "worth-ship." This reminds me that what I "focus on" is what I derive my "worth from". Where, who, or in what are you most tempted to get your worth from (performance at home, work, church, relationships with kids, friends, husband, etc)? which includes an advanced copy of my new book A Confident Heart to read and share with a friend and a $10 Starbuck's Gift Card to share with a friend while you connect face-to-face and heart-to-heart over coffee, tea or dessert....is Brandi. And if you didn't win, this is a great week to order a copy. I've created a special Spring Break PRE-ORDER OFFER just for you! If you pre-order your copy of A Confident Heart through Proverbs 31 Ministries this week (before Easter Sunday) you will receive a signed copy of my book in August, and a free copy of my message "Letting God Fill the Empty Places in My Heart" on CD right after Easter! “Let us not give up meeting together, as some are in the habit of doing, but let us encourage one another..."
I sometimes wonder if I am one of the "some" that are mentioned in this verse. Oh I go to church. I worship, take notes and hang out in the lobby chit-chatting. But somewhere along the way I got "in the habit of not meeting together" with friends as much as I think God wants me to. I didn't mean for it to happen. Each day just seemed to fade into another. I couldn't keep up with everything as a wife, mom, friend, daughter, neighbor, and working/ministering woman. Time with friends was the one thing I could afford to miss. Or so I thought. But then I found myself with an craving for connection that I was trying to fulfill with a white screen and black alphabet keys. Yet no matter how many times I checked email or Facebook, it was never enough to satisfy my craving. Maybe you can relate. If so, be sure to read my "Craving Connection" devotion over at Encouragement for Today. As I think about my craving for connection, and God's emphasis on the importance of us "meeting together," I can't help but believe it's because He created us to need it. We were created in His image after all, and God is always in community - Father, Son and Holy Spirit. Always has been. One of the things that encourages me is to have spiritual purpose to my friendships. I love doing a book study with a friend and meeting to talk about the questions at the end of each chapter. to read and share with a friend. $10 Starbuck's Gift Card to share with a friend while you connect face-to-face and heart-to-heart over coffee, tea or dessert. To enter to win -- share this post with your friends via Facebook, Twitter, your blog and email. Let me know you did and then tell me one friend you will encourage with a call today or an email letting them know you'd love to get together. I'll announce the winner next Monday. Lord, You created us with a need for friends. Yet, we find ourselves rushing through our days with little time for face-to-face and heart-to-heart connections. Help us to seek You first as our ultimate Friend, and then reach out to others so we can have and be a close friend. In Jesus’ Name, Amen. 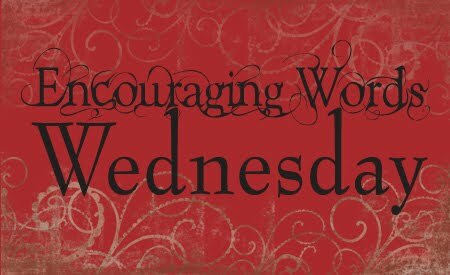 This post is part of my Encouraging Words Wednesday. He sat across the aisle from me, talking to himself. I had boarded a plane very early one morning in TX, after a weekend women’s conference where I was serving with Lysa. I casually glanced over at him and thought, “Oh boy, this will be interesting.” And I closed my eyes to settle in. I was a bit nervous to be honest. We exchanged pleasantries and I closed my eyes again, waiting for the plane to take off. He continued to mumble to himself as he looked out his window. Several more minutes passed. I tried to fall asleep. And then finally, deep in my heart I felt compelled to talk to my seat mate, even though there was still a part of me that begged for my eyes to remain closed; shut off in my comfort zone. “Tell me about yourself,” I reluctantly smiled. I looked around somewhat apologetically as Henry continued to dialogue with me in a very loud tone. I stopped. I pondered. I swallowed. And I blinked. “You, Lord?” I hesitantly questioned. I reflected for a moment and remembered, “‘…I tell you the truth, whatever you did for one of the least of these brothers of mine, you did for me.’” Matthew 25:40. My perspective abruptly softened. I looked at Henry with inquisitive eyes as he chatted away. I examined every detail on his face. I noticed his scruffy beard and bushy eyebrows and I looked deep into his eyes, which he told me did not work very well. Henry was traveling to attend his grandmother’s funeral several states away. He was about to see his father, whom he hadn’t had contact with in 25 years. As our conversation unfolded, I learned that Henry had been born with a birth defect called Poland Syndrome. He had a small left hand with fingers that didn’t move and permanent paralysis in the upper left side of his body. He dropped out of high school several years earlier because students were not nice to him. I listened with interest as we talked about his love of computers. I was captivated by his knowledge, and continued with a long list of questions. We happily shared my granola snack over an animated conversation as he talked and I listened. All of my previous inhibitions had completely vanished. I blinked back tears as I helped him read his connecting boarding pass. I gently smiled goodbye. But my heart was sad as we got off the plane. You see, I knew how close I was to being like everyone else. So very close. And how many times in the past I was like everyone else. I had ministered to women the entire weekend, but I was resistant to talk to the fragile soul right beside me, begging for attention. Meeting Henry changed me that day. Meeting Henry taught me to pray daily for eyes to see deeper, ears to listen more intently and a heart to humbly embrace new perspectives. Open the eyes of my heart Lord. I want to see others the way You do. Because when I do, I learn. And the more I learn, the more I am drawn closer to the One who created it all. Who might be your Henry today? Dear Lord, I want to know You more. Help me to see beyond my normal routine and humbly embrace those around me with a desire to learn. Please teach me Lord. In Jesus’ Name, Amen. The timing of your devotion could not be more perfect. I struggle with control issues and anxiety when I am faced wit the unknown. Sometimes my faith is so strong and at other times, so weak. I am learning, slowly and because of my own stubborn self, that God does not work in fear. He comes in Peace because He is peace. I am learning to rely more on Him and less on myself. I have spent too many years paralyzed by anxiety and fear and I want to learn to live this life, the good and bad, with hope and faith that he will see me through. I want my daughter to see this faith and hope I, along with God, can plant strong seeds of faith in her. Thank you for sharing your thoughts with us. It is comforting to know we do not take this journey alone. I wish I had a copy for each of you that entered to win. You have touched my heart deeply with your stories and your longing for more faith. Tracy, you are the recipient of Wendy Blight's book from my give-away last week. We've got your email so we'll be in touch this week to get your mailing address. The following is a message from my "Living Waters" womens conference in Draper, Utah, Fall 2010. Renee Swope - Part 2 from SMCC on Vimeo. Renee Swope - Part 3 from SMCC on Vimeo. This is a 2-minute sample of DVD clips from me speaking in Houston, TX at the KSBJ Girl's Night Out. The following parenting story was filmed for the 2009 D6 Conference where I shared the honor of being a main stage speaker, along with Angela Thomas, George Barna, John Trent, Jim Daly and many others. If you would would like more information about my messages and availability, please email Leah DiPascal at leah.proverbs31@gmail.com. Words cannot explain life those next weeks and months as she faithfully wore her brace…a brace that deformed her body, caused sleepless nights filled with pain and sorrow, and required her to quit something she loved: competitive cheerleading. Questions plagued her heart. Why me, God? What did I do, God? Questions plagued my mind. Why her, God? What did I fail to do? Please take this from her and give it to me, Lord…PLEASE!! I cried out for healing. We obeyed Scripture. Elders of the church prayed over her. I laid hands on her and anointed her with oil. 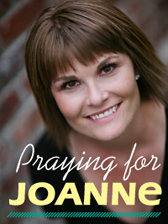 Hundreds of women prayed for her healing. Many nights she lay in my bed, locked in her brace, sobbing, asking, “Why me, Mom?” I lay next to her, tears rolling down my cheeks, exhausted, feeling helpless, wondering how we would make it to the other side of this. Her back worsened despite the brace, so we tried alternative methods. Oh, for a time, the brace kept her curve at bay — until she was 16. A newly licensed driver, varsity cheerleader, confident, strong, funny, and beautiful, inside and out. A beautiful teenager with a curve in her spine and pain that had increased with astounding speed over three years, until it reached the point that we had to face the reality of surgery. A surgery that required this precious child of mine to put her life on hold. A surgery that meant rods and screws would line her spine from top to bottom. A surgery that required months and months of rehabilitation. A surgery that prevented her from ever tumbling again. Healing never came…or has it? At first glance I’d say “no” because the Lord did not heal in the way I so specifically and faithfully prayed. But, when I look at the promised result — it will straighten her spine and allow her to live pain free — I must say, “yes” healing is coming, just not in the way I hoped and prayed. The passion of my heart, the call on my life, is to point others to find answers to their struggles, great and small, in the Word of God. So what do I say to myself as I kneel before the Lord? I allow the tears to come. I shake my fist, asking why has it had to come to this? I ask why did He not choose MY way? I wish I could tell you I wasn’t afraid the day of her surgery. But I would be lying. I was afraid. I was very afraid the day they rolled her away to cut into her spine and insert foreign objects into her body. But I can tell you that I trusted my God, and I asked Him daily to help me with my unbelief. And He did. Heavenly Father, thank You for Your Word. Thank You that it is TRUTH. Father, for every woman whose heart aligns with mine today, direct us to Your Word. Speak truth into our circumstances. Help us with our unbelief. Help us take every thought captive to the obedience of Christ. Fill our hearts and minds with whatever is lovely, true, pure, excellent, and praiseworthy. Father cover us with Your wings. Help us to fully trust in You. I ask this in Jesus’ Name, Amen. Click on the word "comments" below to share your thoughts and/or stories on how Wendy's devotion spoke to you personally today. I'll be drawing one of your names from today's comments to receive a copy of Wendy's Book Hidden Joy in a Dark Corner: The Transforming Power of God’s Story. Afterwards, be sure to visit Wendy's blog to find out what happened with Lauren's surgery. She shares a special video interview with Lauren, too. We're celebrating the first day of April with give-aways and exciting news today at P31! Our She Speaks 2011 Conference is already 2/3 full, which is a record breaker for us! If you are coming, be sure to sign up before our early bird registration ends April 15th or we sell out. Which ever comes first. We fill up every year, but it's only April 1st and we just launched registration a few weeks ago so we are blown away by how fast the conference is filling up. It's gets us so excited to see God move like this. And the sooner we fill up, the better for us since we have a small staff. It allows us to shift our efforts from registration to implementation of God's plans and seeking Him in prayer for the specific women He's bringing. We can start focusing on notebooks, and book appointments, roomates, speaker group assignments, writer peer groups, and all the details once we know where each woman wants to be when she is there. Oh how I hope you will be one of them! We are anticipating an amazing weekend of worship, encouragement and equipping for you and the other 599 attendees and guests from across the country (and some from across the world) who will join us for our favorite event of the year. She Reads life changing fiction ministry. Amy Carroll, our Next Step Speaker Services Coordinator. Karen Ehman is giving away an Encouragement Cafe gift pak and she's featuring our sweet mama Lu (Luann Prater) and her Cafe friends on her blog today. Hope you enjoy these links and enter to win them all. Also, I would love for you to join me on Facebook, too. I am in a season of what I call micro-blogging where I share each day from my heart but in a shorter format. In this busier than ever season of life with a toddler and two teens while also preparing for my book launch and a new website, I'm loving still staying connected with many of you on Facbook. It's exciting but quite "full" time for me and my family, so if you are a blogger and wondering where I am...you can find me there more often. But I'll be back here on my blog next week too! See you then.